Office Hours- By appointment only. Please allow minimum 48hrs notice for all inspection requests. A zoning/land use permit is required when a structure or part thereof is located, erected, moved, reconstructed, extended or enlarged. This zoning permit is required before a building permit can be issued. 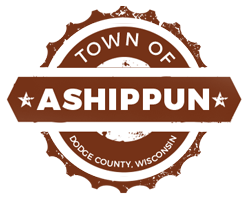 The zoning authority for the Town of Ashippun is Dodge County Land Use Department. Click here to go to their website. The Town has no municipal water service for any properties, all are on Private Well. The authority for private wells is the DNR Drinking Water Specialists, and they can be contacted at 262-884-2356. Please contact Dan Vander Molen in the Highway Department at 262-443-2480. For a new fire number, please contact the Town Clerk at 920-474-4781. –Sewer impact fee for sewered areas- Residential- $6200.00 payable to Ashippun Sanitary District. -Zoning permit: See zoning information above about contacting Dodge County. Please contact Dodge County Zoning, they are the authority for all fence permits and installations.